My brother is seven years younger than me, and he and I both have a soft spot for the millennial bard of angst known as Dashboard Confessional. I think it's because, as with a lot of music, we both associate it with a certain period of time in our lives. What's interesting, however, is that despite the fact that the band looks like it was specifically created for juniors in high school,* we associate it with roughly the same calendar period. ** When I hear Chris Carrabba sing "As for now I'm gonna hear the saddest songs/And sit alone and wonder/How you're making out," it reminds me of being seventeen in a way that's hard to match. This is the same music that reminds Tyler of being ten. I was thinking about The Dash, and this idea of contextual nostalgia, as I was reading Steven Hyden's wonderful Grantland article on why we don't remember the Counting Crows in the same way we remember Nirvana. He makes a strong case that our memories of things like music often have less to do with merit and more to do with the stories we tell about ourselves, and it's worth a read for that aspect alone. The article also discusses the Counting Crows in a favorable light, which is cool, because it's basically a justification of my taste in high school, so there's a second reason to read it. But there's another idea in the article that I think deserves more exploration. Towards the end, he talks about the songs "All Apologies" (Nirvana) and "Anna Begins" (Counting Crows), and how each is an example of a different type of sad song. Before we go any further, let me take a minute to say that "Anna Begins" is both great and incredibly underrated; it captures a very weird and specific life event that is nonetheless relatable, it has interesting chord jumps and an unconventional structure and a syncopated shuffly thing going on, it starts with a BANJO. It's been one of my favorite songs since the days of Napster, and it does not deserve to be written off simply because it's sung by Adam Duritz and contains the line "Her kindness bangs a gong." Anyway. So Hyden makes the case that "All Apologies" is a tangentially sad song, because it's not actually sad but is associated with tragedy, and "Anna Begins" is a realistically sad song, because it is actually sad and deals with real stuff. 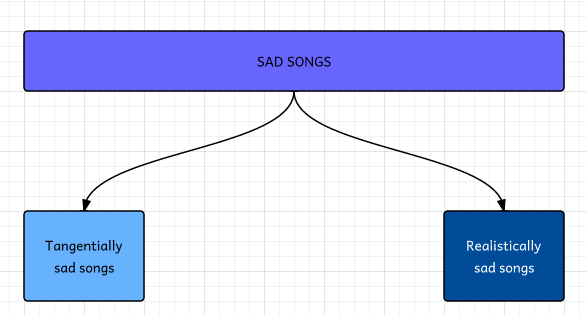 The Hyden theory of Sad Songs. This is useful, but I don't think it goes far enough. Within the world of songs that are Actually Sad, there's another distinction that needs to be made: romantically sad songs versus those realistically sad songs. And, depending on who you are and where you are when you hear them, some songs have the potential to be both. 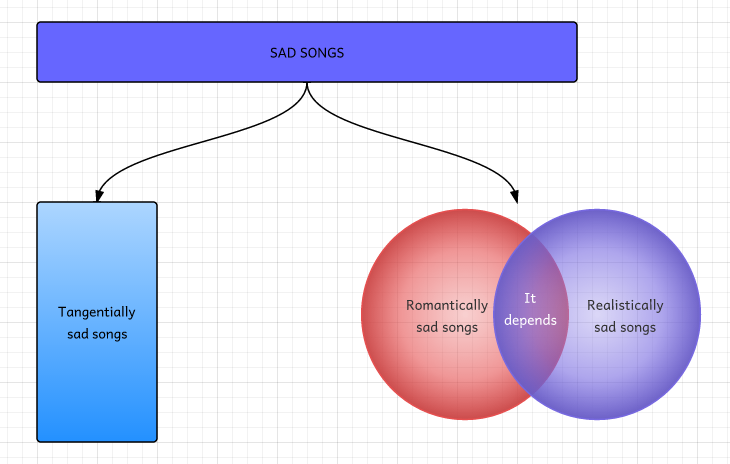 The Eason theory of sad songs. A romantically sad song implies that something good was associated with the sadness; it's almost aspirational. "Last Kiss" and "My Heart Will Go On" are romantically sad songs. A realistically sad song, on the other hand, will (as Hyden puts it) "make (you) cringe a bit." It's a song you can probably relate to, and not in a fun way. The Mountain Goats' "The Mess Inside" is a realistically sad song. "Mr. Bojangles" is also a realistically sad song. The average listener might hear "Last Kiss" and imagine that they'd like to have a love that extends past death. No one ever listens to "Mr. Bojangles" and thinks, "I wish I could be THAT guy." And, of course, there are the songs that fall in the middle. Bush's "Glycerine" is dreamy for a sixteen-year-old; there's intensity! conflict! Because the love is so strong, but so is the pain! It represents the kind of life experience that a high school student might crave: mistakes, but mistakes as a result of love and freedom and self-actualization. The same listener, at the age of thirty-two and with more life experience, might focus more on the lines "Could've been easier on you/I couldn't change though I wanted to." Not being able to change, when you're old enough to want a more straightforward happiness: that's not fun anymore. Once you've learned how this kind of fatigue feels, though, it's different. I think Hyden says it best here: "The song is so direct and plainspoken that it hardly seems like art; it just sounds like dialogue that's been transcribed from a million arguments between emotionally exhausted parties. "*** It's beautiful, maybe, but it's not romantic, not exactly. Which brings us back to Dashboard Confessional. I hear those songs differently now, and I would imagine that Tyler does too (at least, I hope so). I still remember what it was like to listen to The Places You Have Come to Fear the Most in my car, at night, on the way back from my job at the Mall St. Matthews, and when I hear it now those memories form a translucent layer over the experience. But I also hear it as it is, which is painful and uncomfortable and a little bit shouty. And I suppose that hearing both, and creating that narrative about myself, is what it means to grow up. *My high school was not legitimately cool in any way (save for the NBA star who graced our halls), but it had a LOT of marching band kids who started bands with names like The Van Buren Boys.